This series is called: " Monster Wrestlers in my pocket ". It was made 1995 and account 8 wrestlers + Tony the Tiger in limited edition. We find this last one in two versions. The one with the distinction "Coach" for the USA and England, the other one with "Tony" for the other countries of Europe. They are in 45 mm. On the base, it is two executives from Mattel who are going to create enormous series, distributed by Matchbox. All the series Of Kellogg's are extracted from it. 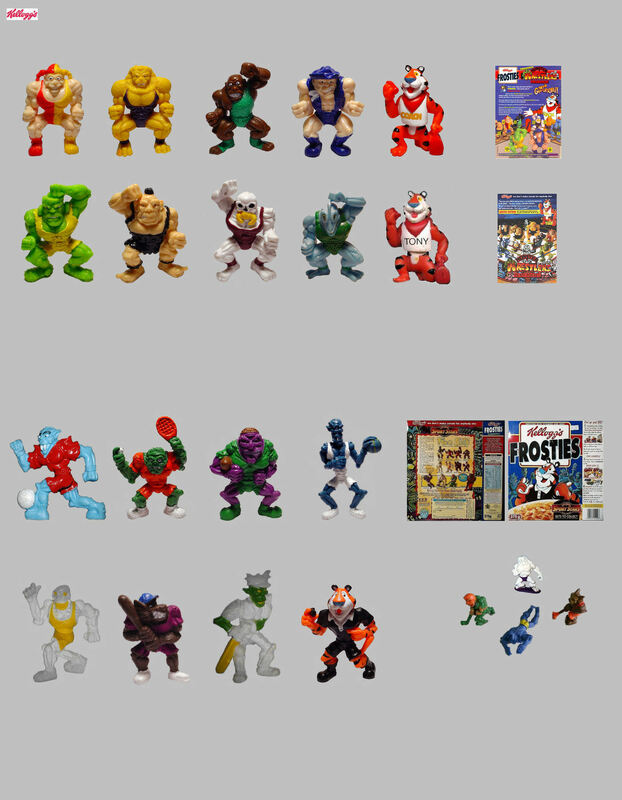 It is in fact three series of 4 characters that Kellogg's offer in 1996. This time, Tony the Tiger is an integral part of the team. They are " Sport Stars ". The third series is very rare to find. Other bigger photos will be presented to you as soon as possible. The sizes are identical to those of 1995.